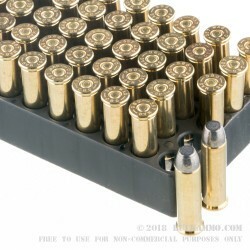 Made for the avid cowboy action shooters who deal in the realm of the .357 Magnum this bulk ammo is a near perfect replica of old school ammunition that is sanctioned for the sport and offers a realistic take on what was shot when this was a real thing, instead of a sport. 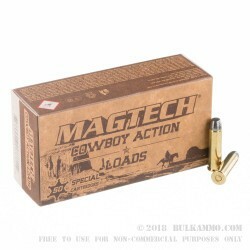 The MagTech Cowboy action line is a great rendition of high quality, all lead projectile ammunition that is meant for use in these types of competitions. It keeps the shooter and their competition honest. 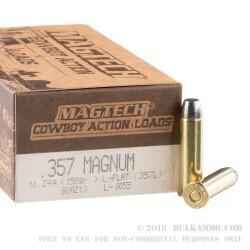 The Lead Flat Nose projectile in this .357 Magnum is a 158 grain bullet that is loaded to work reliably in older firearms and replicas of older firearms. Note: Please be sure you are firing this ammunition in the correct chambers and that you have a firearm in good working condition that is of sufficient modernity to be able to fire these smokeless powder rounds safely. The MagTech offers a suitable 1085 fps velocity and 410 ft. lbs. of energy which allows it to be used across all cowboy action platforms from rifle to pistol and beyond. The numbers might seem slightly anemic, but the point is that they will reliably and safely function in all firearms for that competition. 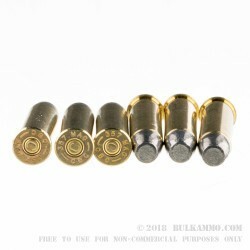 This is not meant to be a hot load of personal protection ammunition. For what it’s designed for, it’s hard to beat.